Chyrisse Heine knows Cambodia’s rural provinces well. 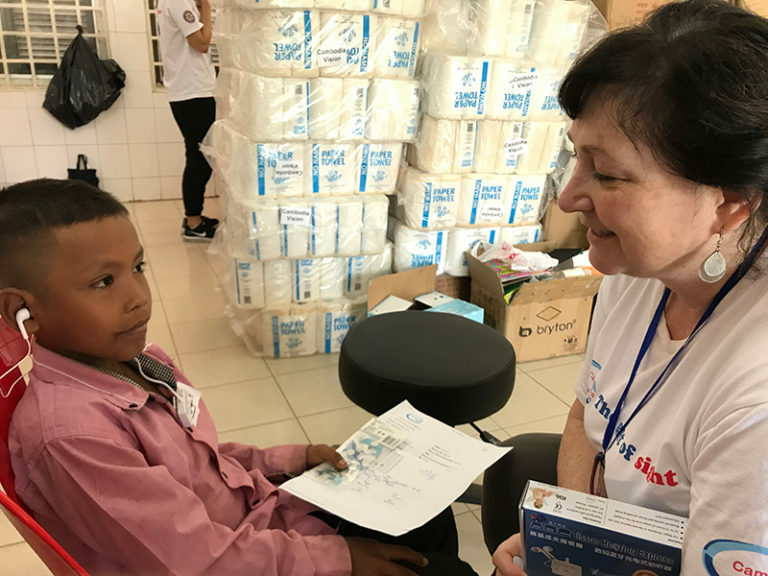 She travels there regularly—and has for years—in her work for Cambodia Vision, which provides health care to Cambodian residents. In oppressive humidity and with limited resources, Heine works with a group of volunteers to provide hearing care and treatment for the organization. Last year, her team helped more than 700 people—46 of whom experienced the ability to hear for the first time. An associate professor at La Trobe University in Melbourne, Australia, Heine is an audiologist and speech-language pathologist. In addition to teaching and leading her annual volunteer trips, she runs her own private practice, is a director at Speech Pathology Australia, and founded the Speech and Hearing Project, a not-for-profit to involve speech-language pathology students and graduate students in volunteer work. But her work in Cambodia really drives her. Audiologist Courtney Caron spent four years in Africa creating a full-service hearing care clinic from the ground up. An audiologist creates free hearing aid programs from Nebraska to Nicaragua. After working with various NGOs in Cambodia for a few years, Heine embarked on her first mission with Cambodia Vision in 2016.